Ever have one of those days when it seems like things just are not going right? Yesterday, I walked into my house after being gone for a few hours and was greeted by my dogs with love and affections as per usual. However, all of the sudden there was a different sound in the house. The dogs started barking, and I started walking around trying to locate the sound. It sounded like rushing water at times and at others like a cutting, buzzing sort of sound. It would quiet; then it would start up again. It was quite loud, and it was loudest in my bathroom. It seemed to be coming from the wall behind my bathroom sink. I checked the faucets—they worked, water flowed. I checked under sink and found no leak. I checked my toilet’s functioning, and it was fine. I walked down into the basement to make sure everything there was okay, and there were no leaks dripping down into the basement. In desperation, I finally called a friend who helps me out with hand man jobs around my house and let him listen to the “racket” over my speaker phone. He told me not to worry; that it sounded like calcium was probably blocking the flow of water due to recent rain. I had visions of water damming up behind my bathroom wall ready to explode out and flood everything. I tried to ignore the noise, and I even worked on fixing an office chair. It had a loose arm-rest that needed screwed on tighter with a small Phillip’s screwdriver. I turned the chair over on its side and tightened up the screw. Then I tried to lift the chair back up on its legs. Of course, I used the arm rest to lift the chair, and the entire arm rest, tightened screws, and all broke off in my hand. I was halfway ready to entertain the idea of Gremlins running amuck in my house trying to do whatever mischief they could just to irritate me. The noise continued to be bothersome. It was like having a dentist’s drill constantly drilling in my bathroom. I tried drowning the noise out with television. That didn’t work. Then, I finally got the great idea of shutting the bathroom door. That made the sound at least bearable, and, lucky for me, the door managed to stay on its hinges. 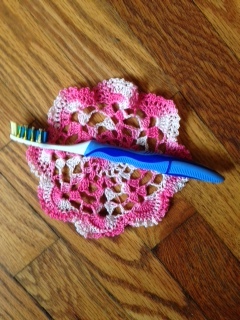 A friend came over to help me work on setting up my “Kathy’s Warm Fuzzies” website (https://sites.google.com/site/kathyswarmfuzzies/) where I will be selling items I crochet (shawls, cowls, hats, doilies, mandalas, scarves, afghans, etc.) as well as earrings I make. We were able to work with the background noise, but when we finished, my friend helped me, once again, to try to find the source of the noise that had been going on for at least three hours by that time. She found a plastic tray that was up against my bathroom wall, and, in the tray, she found a battery-operated toothbrush I had even forgot I had. And, yes, it was the toothbrush buzzing away and vibrating everything on the tray up against the wall that was making all the racket. I am pretty sure God got a good laugh out of that one——He and the ghost who turned the toothbrush on in the first place. What’s the spiritual point of all this? Well, when I feel on edge, and, yes, anxious, and am unable to ascertain the reason, it is important that I “keep on keeping on”—–and that I let friends help me as they can often notice what I don’t. I think that is how God works. When I turn things over to him in prayer, the “solution” to whatever is bothering me, identified or not, occurs. And it usually occurs when I get myself and my stubbornness out of the way and become receptive to help from God and others. Oh, yes, it helps to have a sense of humor too! God bless and keep you. Sometimes, a different set of eyes and ears are all that is needed. It is GOOD to have friends and the Lord. Thanks—–glad to hear you are getting your own website. I’ve found the only way to write is to “just do it.” Good luck!